Last weekend was mild in temperature compared to how it should be this time of year, and that gave us the perfect excuse to fire up the grill, possibly for one last time, before winter hits hard. While we are not big on hamburgers, Joel and I both really enjoy burgers made with ground chicken. Perhaps it is because we like chicken better than beef, but generally we find that chicken burgers tend to be more flavorful and not as dry as their ground beef counterpart. I had flagged this burger recipe back in May from Tracey's Culinary Adventures, originally Elly Says Opa, and had been looking for a reason to make it. This burger did not disappoint! Rather than serving these on hamburger buns, we made homemade bread and served these along with a slice of it. In a large bowl, lightly mix the chicken, parmesan, bread crumbs, seasoning, parsley, garlic, shallot, salt, and pepper. Cover the bowl with plastic wrap and place it in the fridge for about 30 minutes for the flavors to meld together. Separate the meat mixture into 4 patties and grill until cooked through, about 10-15 minutes, flipping once during cook time. Top each burger with a slice of mozzarella cheese and continue to cook for about 1 minute, until the cheese starts to melt. 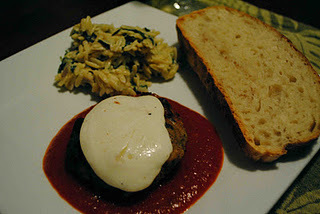 Top with marinara sauce and serve on a roll or with a piece of crusty bread.